England’s trusted number one, Joe Hart, is out with an injury, which means England will have to replace him with someone else. Joe Hart picked up an injury during Manchester City’s 1-0 loss to Manchester United over the weekend. He was stretchered off due to a calf injury which he sustained when carrying out a clearance after a shoddy back pass from City defender, Martin Demichelis. The extent of Hart’s injury was confirmed in the post-match interview, with Manchester City boss Manuel Pellegrini stating that it would sideline the player for at least a month. Roy Hodgson is now faced with a dilemma, missing his trusted shot stopper. He was pressured into picking a squad without Joe Hart for the upcoming international friendlies against World Cup Champions Germany, and the Dutch national team. Midfielders: Dele Alli (Tottenham Hotspur), Ross Barkley (Everton), Eric Dier (Tottenham Hotspur), Danny Drinkwater (Leicester City), Jordan Henderson (Liverpool), Adam Lallana (Liverpool), James Milner (Liverpool). Included in the squad is Burnley goalkeeper Tom Heaton, who has replaced the injured Joe Hart on the team sheet. It is not the 29 year old’s first time being called up for international duty, although he has never made a senior appearance for the national squad. It is highly unlikely that Tom will feature in the upcoming international friendlies, as well the Euros, but he is a sensible last resort for the manager during an injury crisis. It is almost certain that Roy Hodgson is going to replace Joe Hart with his second choice goalkeeper – Jack Butland. The 23-year old goalkeeper has had a consistent run of games. He is a reliable and intelligent player who will only improve with time. He may be England’s best option for the upcoming Euros, provided Joe Hart doesn’t become fit by then. Jack Butland has not had quite the illustrious and trophy filled career like Joe Hart. He has been a player of Stoke City since 2013, although his career has seen many loan spells to Premiership and Division sides in attempts to develop him. He managed to secure the number one spot in the Stoke City squad after Stoke sold their former first-choice goalkeeper Asmir Begovic to Chelsea. Butland has produced several man of the match performances for Stoke this season, pulling the team through tough games, in a similar way that David De Gea is doing for Manchester United at the moment. Butland managed to make his England senior team debut in 2012 against Italy in an international friendly, after Joe Hart was ruled out with a back injury. He then proceeded to become England’s youngest ever international goalkeeper, at the tender age of 19 years and 158 days. He later made two more appearances for his national side in 2015, during the end of the UEFA Euro 2016 qualifiers. At the moment, it seems that the only way Jack will miss the UEFA Euro 2016 for England will be if he sustains an injury. He will most likely play two of England’s biggest games this year, against the reigning World Champions Germany as well as the Dutch national side in the international friendlies to come. If England manage to beat these two sides, it would assert their ambitions and make them a more feared squad during the Euros. Jack Butland will certainly be put in the spotlight if he is included in the starting XI vs Germany and Holland. He will have to deal with the attack of some of Europe’s most feared strikers, including players like Thomas Muller, Memphis Depay, Marco Reus, Mesut Ozil, and many more. “The problem is that in England we don’t tend to give young goalkeepers a chance. We go for the experienced goalkeeper every time. “You look at the likes of Casillas or Buffon – these are goalkeepers with over 150 caps because they started in their teens. 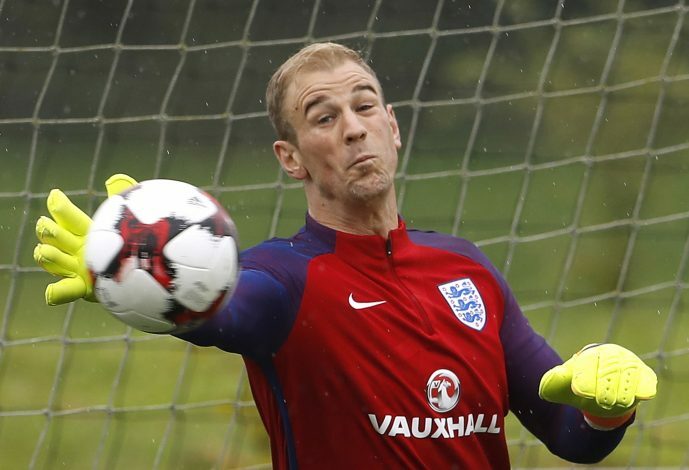 Ideally, England would have to opt for their most trusted goal keeper in the form of Joe Hart. He has been key in England’s matches prior to qualifying for the Euro 2016 and will be their best hope between the sticks due to his immense capabilities and his acrobatic style of goalkeeping. But, if the worst scenario is to play out, in which Joe Hart remains injured, it will definitely be Jack Butland who will be responsible to save the day. He may only be 23 years of age, but he is the perfect replacement for Joe Hart and it will be surprising to see Butland get injured prior to the Euros 2016 due to his relatively uncluttered fixtures. He has been in a good run of form for his club and is statistically one of the best in the Premier league at the moment, and is even being compared to the likes of David De Gea and Petr Cech. Only time will tell whether Butland will play for England in the Euros 2016 to come. But he would definitely be a solid replacement for their current number 1. Do you think Jack Butland should be given a chance in the upcoming Euro 2016 fixtures?